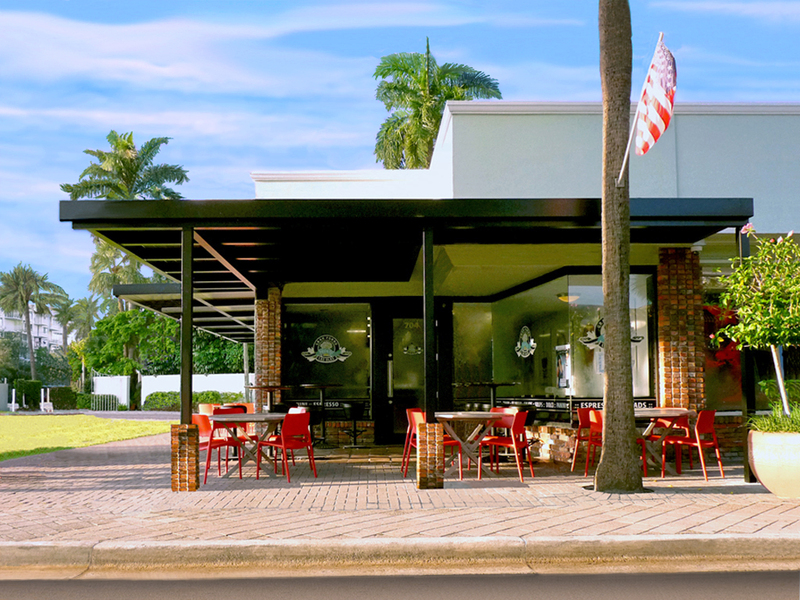 The restaurant and hospitality industry has grown to become a specialized area of work for us. 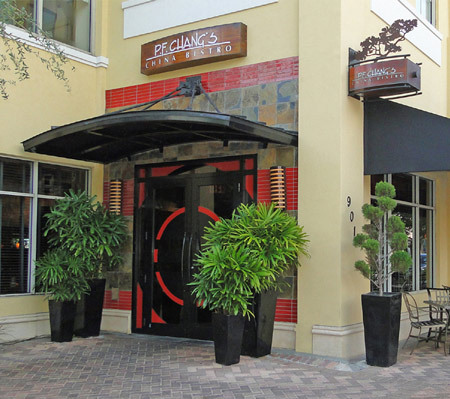 Our work has ranged from local "Mom and Pop" businesses all the way up to Fortune 500 chain restaurants and hotels. 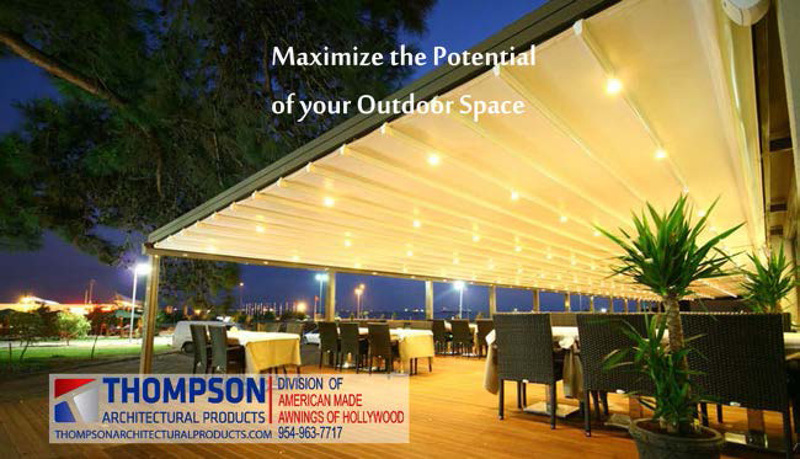 The mainstay in the majority of the jobs is maximizing the use of outdoor space. We have taken areas that were once just hard ground and transformed them into bustling, money producing covered patio areas. 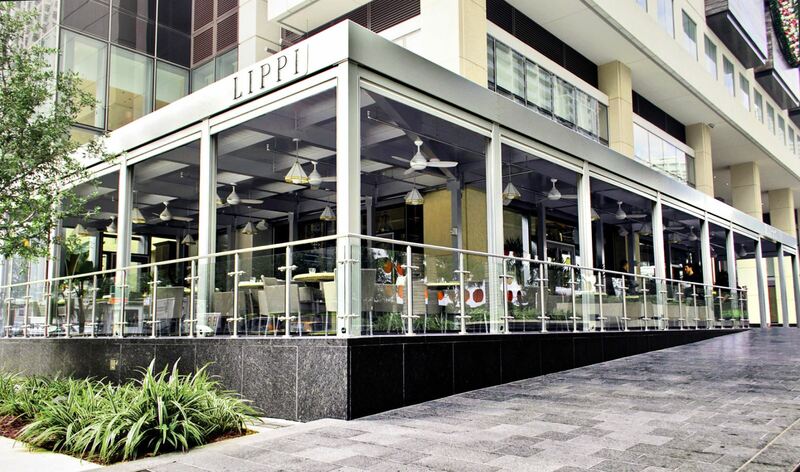 They range from a concrete slab with an awning cover to marble floors with retractable roofs systems. An area that was unusable before becomes an “in demand” seating area. The possibilities are endless with the addition of accessories such as roof vents and ceiling fans to increase air circulation, misting systems for cooling, lighting systems to accent the fabric, portable heaters for the cool weather and railings or fencing if a boundary needs to be established. If sun is your main problem, we have retractable solar shades that roll up and down or those that slide horizontally. With the mesh shades in the closed position you can still see the view, but without the blinding glare, intense heat and harmful effects of UV rays. When the rain starts or the breeze gets too strong, you can press a button and roll down the weather curtains while still having visibility and light from the clear inserts sewn into the curtain fabric. With the right accessories for your climate, you can actually have a “Four Seasons” room that will allow maximum seating capacity every day of the year. 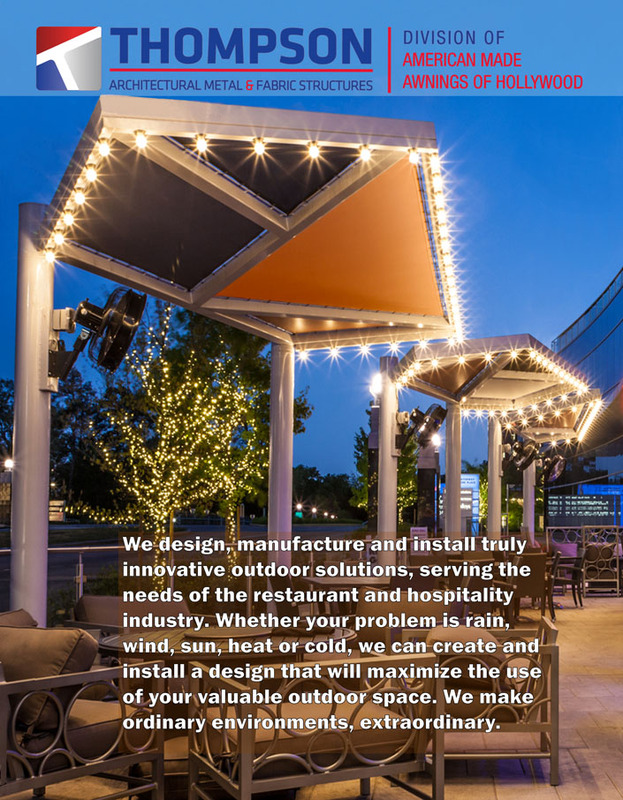 Roofs and covers can be custom fabricated in fabric, architectural aluminum, standing seam metal, or combinations of materials to achieve the right feeling for the environment that you want to create. 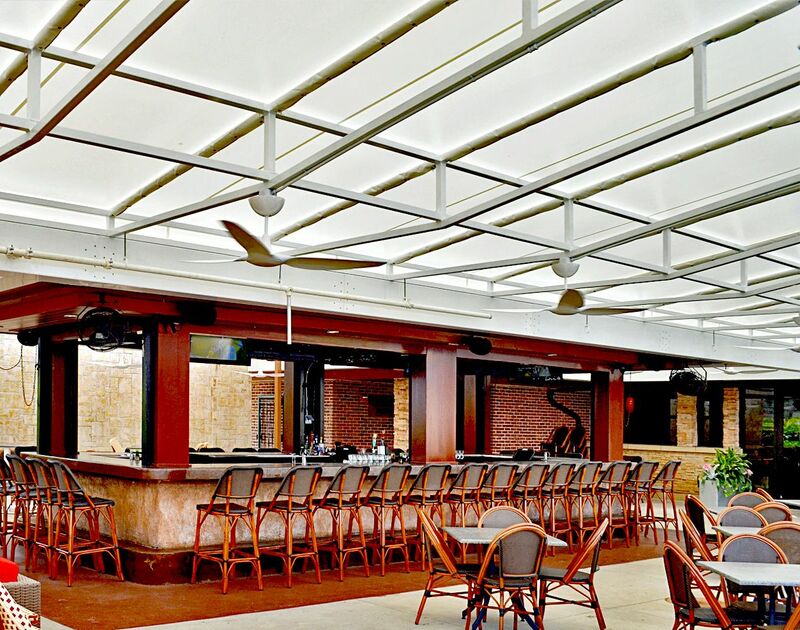 Our retractable roof system will give you the best of both worlds. 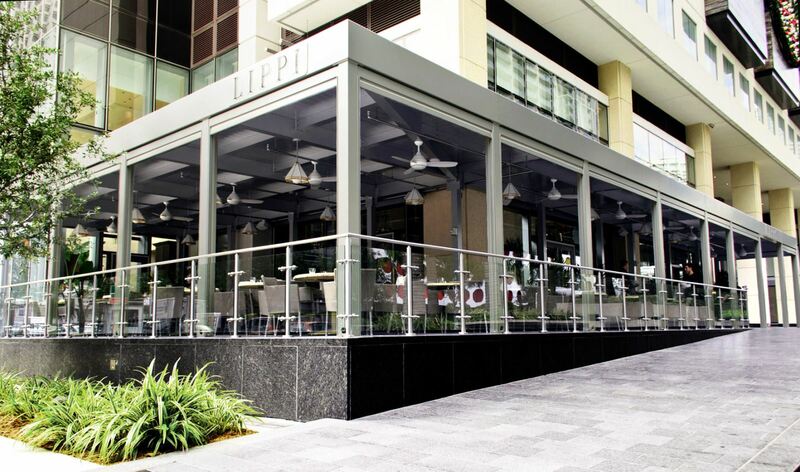 Open it in the evening to get true outdoor dining and close it to block the sun or rain. It comes complete with an integrated water elimination system to collect and drain water. 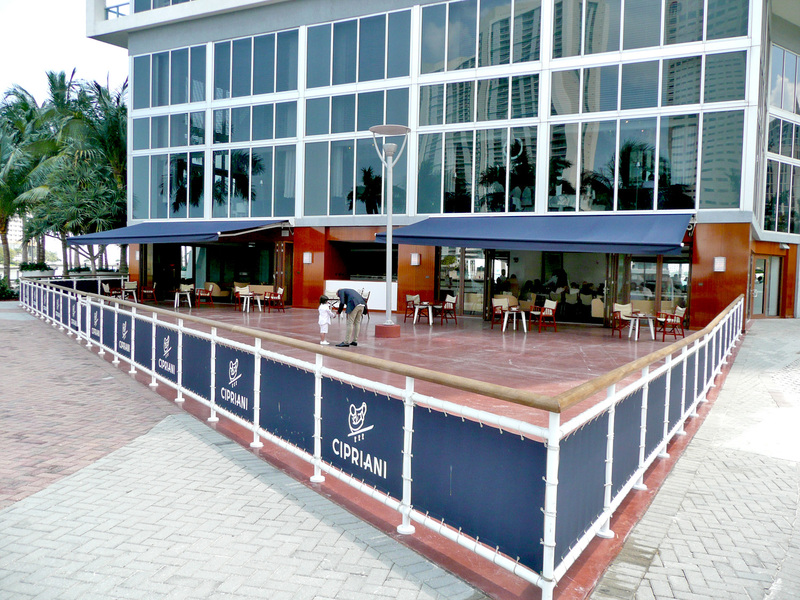 The tension sail awning is another popular fabric product, used as a functional architectural accent it will bring new life to otherwise lackluster environments. These can be designed in a variety of sizes, shapes and vibrant colors. The design can include overlapping sails, creating large shaded areas, while forming a geometric design of intersecting colors and shapes. We have installed them in lobbies, over playground areas, swimming pools, sitting areas, inside and outside bars or just as a design element on the interior and/or exterior of buildings. We are geared for 24 hour installation availability. We will schedule our work hours so that we don’t interfere with your business hours. Give us a call to discuss the possibilities of expanding your seating area with one of our unique designs.